I've wanted to attend CILIP's annual New Professionals Day for a couple of years now but the timing has never been quite right for me. Luckily this year things worked out and I was able to attend. I always feel a bit funny describing myself as a new professional and I'm not sure I really fit the criteria laid down for the day - I've worked in libraries for eleven years now but I've only just completed my master's degree. I'm also not in a professional post as my job doesn't officially require a librarianship qualification. However this didn't seem to matter to anyone yesterday and I was pleased to see a mixed bunch of people of many ages and backgrounds in attendance. If nothing else I think I learnt to stop worrying so much about the new professional label! 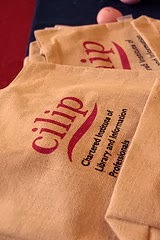 The keynote speech was given by Barbara Band, school librarian and vice chair of CILIP. Barbara talked about the need for core librarianship skills no matter what sector we work in. It's essential that we meet the needs of our institution first and foremost but we must also remember the values of the profession. Barbara encouraged us to accept and use our traditional skills whilst also moving with the times. This may be easier said than done as we live in a time of such rapid change but it is possible. All these changes represent a chance for us to grow and learn if nothing else. Learning is something which I know many librarians are passionate about and I think one of the main reasons that the profession attracts so many enthusiastic people. It's certainly one of the best parts of librarianship for me - as evidenced by the title of this blog! Barbara spoke about how librarians are often aware of emerging trends before our colleagues and so can be proactive rather than reactive, an enviable position to be in I think. I was also glad to hear Barbara talk about the importance of continuing CPD. This is something which I've been thinking about a lot recently and based on the response to both this keynote and the session that I ran at LibCampEast on the topic, many others feel the same way. CPD doesn't have to be all about spending days on end at courses. Saying yes to opportunities and getting involved can provide many ways of developing and learning doesn't just happen on the job. There are many methods of CPD which you can fit in around your schedule, no matter how busy you are! The rest of the day was filled with workshop sessions. Firstly I attended That Media Librarianship Gameshow with Laura Williams. Laura talked about her role as Media Logistics Coordinator at ITV. Although people might not think of this as a librarianship role it uses the core skills set of the information professional involving a lot of internal information management. It's important to remember that you will be applying against a much wider field for a career in media librarianship. There will be film students and those looking to get their foot in the door of the television business so it's important to remember the skill set you bring to the table as an information professional. Keeping up to date with the changing technology of the information world is a definite challenge but Laura was quick to point out the many rewards of a career in the media. She reminded us to look beyond the vast array of job titles as think about what we could offer with our backgrounds in librarianship. After a lunch of burritos (which I can confirm live up to the hype!) we were back in workshop sessions. I attended Information Roles in Careers Services led by Megan Wiley, Victoria Stevenson and Matt Bedwell. The careers centre at the University of Bristol sees students at all stages of their academic career. The work involves information management, enquiry desk work, user training and current awareness activities. Resources have to be kept up to date and there is a great deal of judgement involved in the role. No formal 'reading lists' are provided so it's important to keep on top of the latest information on a wide range of careers. The team has to communicate to a lot of different users in a lot of different ways which keeps things interesting! The final workshop I attended was Mandy Powell's session about Developing Professional Skills. This session echoed a lot of what was mentioned in the keynote and so provided a nice way to bookend the day. Mandy stressed the importance of developing skills outside of your current role. This doesn't mean that you have to spend every evening and weekend doing CPD but it will make you CV stand out from the pile if you demonstrate that you have taken the initiative and done something unexpected. It's important to keep a record of your activities, even if you're not actively pursuing Chartership or job hunting at the moment. You never know when a portfolio of developments may come in handy! I really enjoyed my first experience of New Professionals Day and I'm a little sad that I've never made it before. I would encourage anyone who is thinking about attending to go. It really is an inspiring and motivating day (and I'm not just talking about the post conference pub trip!). Barriers to a Great User Experience?